Update: The Nintendo Switch presentation is over, but you can watch the full replay below! 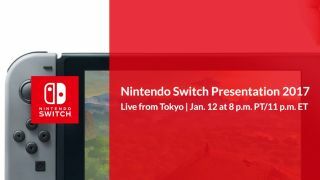 Ever since the Nintendo Switch was unveiled last year we’ve been eagerly awaiting more details about the new handheld/console hybrid, and on January 13 Nintendo will host a special Nintendo Direct livestream to reveal more about the device – and we'll show you how to watch it. As with previous Nintendo Direct livestreams it’s pretty easy to tune in, but one issue for people may be the time the livestream broadcasts, as it will be beamed live from Japan at a time when people in other time zones will be in bed. Never fear, however, as we’ll show you how to catch up on the Nintendo Switch launch livestream after it’s been broadcast, and Nintendo also have aTreehouse event a few hours later, which will concentrate on the games that will be coming to the Nintendo Switch. While the stream will be in Japanese, but there will also be a video on Nintendo’s YouTube account dubbed in English. Now that the presentation has finished, you can rewatch it by clicking the video above. You can also watch the stream live on the official Nintendo Switch website. Nintendo will also be showing the Switch Direct launch livestream through its Twitch account. If you're not able to watch the video, then check out our Nintendo Switch release date, news and features article, where we'll have all the latest news. You can also follow us on Twitter, where we'll be posting breaking news. Nintendo will also be posting on Twitter using the #NintendoSwitch hashtag. Nintendo Switch Price: how much will it cost?